A plate of Phat kaphrao mu krop with rice. Phat kaphrao (Thai: ผัดกะเพรา, pronounced [pʰàt kā.pʰrāw]; transl. 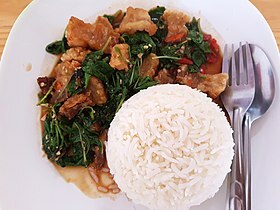 stir-fried holy basil), also spelled pad krapow, kaprao, is one of the most popular Thai à la carte dishes. Phat kaphrao mu sap with rice and a fried egg. By some accounts, phat kaphrao was included as part of Prime Minister Field Marshal Plaek Phibunsongkhram's Thai cultural mandates during WWII. Phat kaphrao, as well as pad thai, were one of the promoted dishes in local Thai food contests. Phat kaphrao was inspired by stir frying, the cooking process of Chinese people. Some of the first four survivors of the Tham Luang cave rescue asked for phat kaphrao as their first proper meal after two weeks of being trapped inside the cave. Phat kaphrao consists of meat such as pork, chicken, beef, and seafood stir fried with Thai holy basil and garlic. It is served with rice and topped up (optional) with fried eggs or khai dao (Thai: ไข่ดาว). The main seasonings are soy sauce, Thai fish sauce, oyster sauce (optional), cane sugar, and bird's eye chili. Over time, phat kaphrao has evolved with the addition of other ingredients such as Chinese century eggs and Thai local vegetables, namely asparagus beans, baby corns, onions, carrots, cowpeas, banana peppers, mushrooms, Chinese kales, bamboo shoots and coconut shoots. However, adding vegetables in phat kaphrao is also seen as an effort to reduce the cost of meat and increase profit margins on the part of food vendors. ^ Thuan, Willy. "Thuan, W. (n.d.). Top 10 Thai Food - Most Popular Thai Foods". Bangkok.com. Asia Web Direct. ^ "A Brief History of Pad Kapow". ^ "History of Phat Kaprao Kai". 17 August 2017. ^ "Cave rescue resumes in Thailand". 7 July 2018. ^ "A Garlicky Stir-Fry With Basil Leaves From Bangkok". 25 January 2018. ^ "Why Phat Kaphrao needs cowpea". 30 March 2016. This page was last edited on 23 April 2019, at 18:55 (UTC).